The 100 bp DNA marker consists of plasmid DNA that has been digested with endonucleases to yield 12 defined fragments. The intensity of the 500 and 1000 bp bands are increased as identifiers. The ZR DNA Markers are defined DNA size fragments that encompass a range of sizes from 50 bp up to 10 kb. This makes DNA size approximation easy for both PCR products as well as plasmid DNAs. 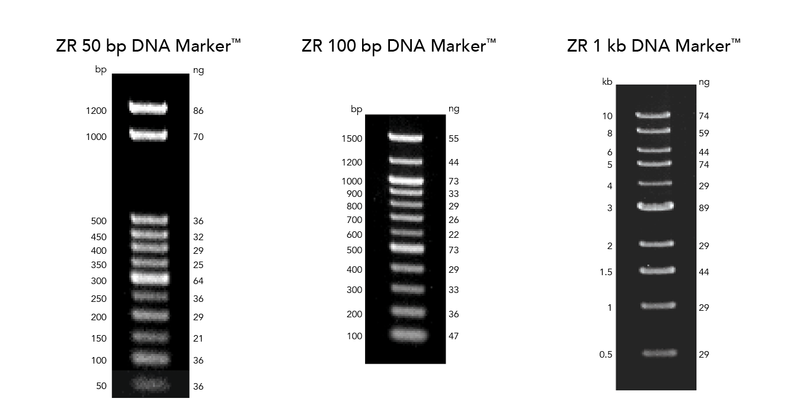 The ZR 50 bp DNA Marker, ranging from 50 bp to 1200 bp, is well within the common range of PCR generated DNA fragments. For larger DNAs, the ZR 100 bp DNA Marker and ZR 1 kb DNA Marker are appropriate. Inclusion of an intensified band is provided in each marker for easy identification. Each marker comes with product information detailing the product and its application.